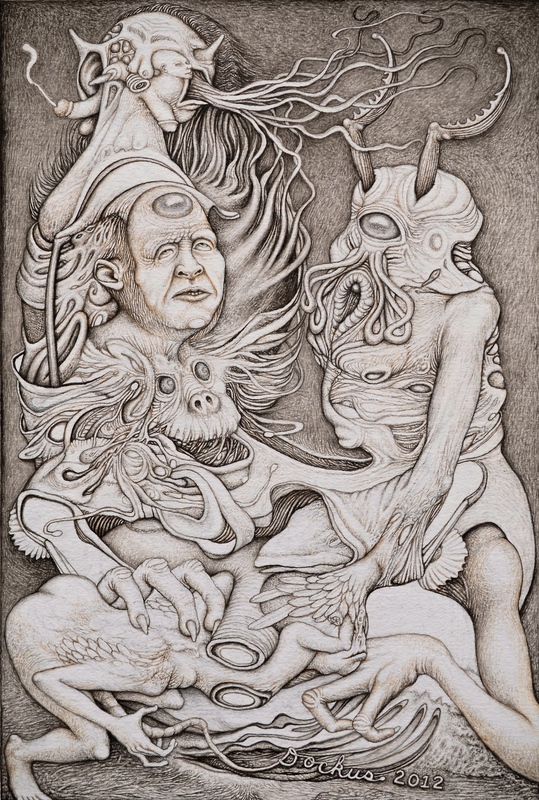 This entry was posted in art, Drawing, ink drawing and tagged anthropomorphic, grotesque, hybrid, Jung, Lovecraft, outsider art, psychology, weird. Bookmark the permalink. Brilliant art and writing and the quote from Jung hits home for me. Thanks for the connection. Looking forward to studying more of your work. Thanks for bending the connect, reaching it back to here, and making it into a circuit between us, Jennifer. I’m still trying to find the balance between, not just browsing on-line (which the majority does), but really looking at the work of some others, trying to leave engaging and meaningful comments (I’ve offended a few, believe me), and focusing on working on my own art. You seem to get into a rhythm of production of works, Jennifer, a remarkably impressive output, but your input too I’m sure is highly valuable. I figure an artist and a woman like you is also very wise and has teacher and instructor in her too. I began the image in this post before I ever started this blog and discovered your marvelous work. The Deep Sea metaphor and the title of this work only recently came to me through a confluence of elements. As I know you know, so many elements from diverse sources go into one work of art. It would be a daunting task for any artist to give an honest and faithful account of what led up to the creation of a work, what came together in it while actively engaged in it, what was rejected, and why. There are higher operations in the creative mind which moving in Mystery the artist doesn’t really understand. I think you and your work is definitely in here somewhere as an influence. On some level a current is shared. It gives me pleasure to share with you and other artists this flow back and forth over the Archetypes. I feel it’s a real connection, Jennifer. It gives me this sense that – each of us having a particular skill set and talent for particular manifestations – in some profound way we’re extensions of each other, that quite naturally we make our works not only for ourselves but for each other. Thanks, Jennifer, for leaving a comment!